Steve Francis wore this jersey for at least five games during the 2001-02 season including January 10th, 2002 against the Utah Jazz and January 31st against the Dallas Mavericks. Against the Jazz Francis recorded 27 points, 4 rebounds and 3 assists. Against the Mavericks Francis scored 30 points while adding 6 rebounds and 7 assists. 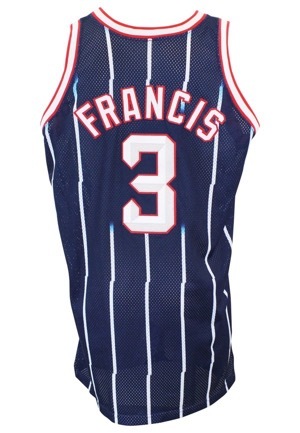 In addition to those two games Francis also wore this jersey on January 15th in a 15 point effort against the 76ers, January 21st against the Hawks where he scored 25 points and January 26th against Charlotte adding 30 points. 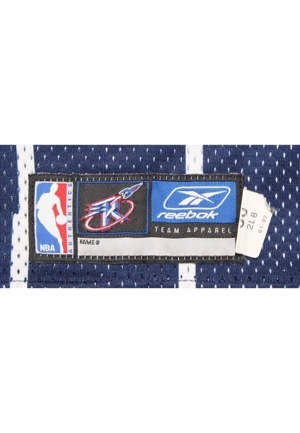 On the front left tail is the Reebok manufacturer’s tag with an attached flag tag reading the size and year “50 2 LB 01-02”. On the left inseam is a flag tag with jersey materials and washing instructions and a “Produced By UFCW Union Labor” tag. 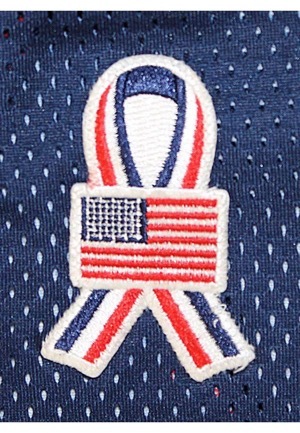 On the upper left chest is the official “NBA” logo embroidered and on the upper right chest is the 9/11 memorial ribbon with an American flag patch. 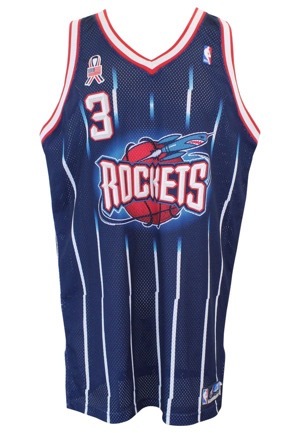 Across the chest reads “ROCKETS”. Above this and on the back is the player number “3”. These are done in white and silver on red tackle twill. Across the back is the player name “FRANCIS” in white on red tackle twill. This jersey is properly tagged, was presented to us as game-used and in our opinion shows appropriate use. Accompanied by a LOA from Photo-Match.com confirming the matches to Getty images #1494932 (@ Dallas) and #72319950 (@ Utah).